Do you enjoy people watching? When you see someone just waiting, do you ever speculate on their back story? 'The Bench' explores this curiosity as, over the course of one spring day, several different scenes unfold on and around a bench. Fourteen different characters come and go, allowing us a glimpse into their lives - the jogger, the mother, the school child, the bag lady. They are all part of the life of this rural Recreation Ground. Come and do some people watching with us. 'The Bench' was written by Jamesine Cundell Walker and has toured several venues in and around Yorkshire, Cumbria and Essex. 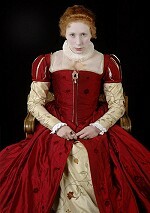 Jamesine is currently Artistic Director of Ilkley Playhouse..
‘The year is 1544 and King Henry, the Eighth of that name, is engaged upon Royal Progress about his Realm; and has halted here to afford his Loyal Subjects the opportunity to have 'audience' with their Sovereign Lord and King. The King, recently married to his new, and sixth, wife, Queen Catherine Parr, is in poor health; his leg continues to cause him considerable pain and he is often in a poor humour! In the course of the 'audience', His Majesty will recount the events of his long reign; telling of his wives and his children, and His Majesty will invite his Loyal Subjects to petition him or question him on any related subject : there may be some surprising answers! Orlando: Who is she? Who is he? Who are we? Find out in the life-affirming, comedic tale of an immortal poet, whose gender cannot be pinned down, whose spirit cannot be caged, and whose irreverent, romantic adventures across British history – from the 1500s to the present day – provide a magic-realist exploration of human identity; personal, sexual and national. Drawing on a decade's worth of critically-acclaimed theatre-making, Dyad Productions – performer Rebecca Vaughan and writer/director Elton Townend Jones – explore what it means to find our place in the world whilst remaining utterly true to who we are. Based on the satirical 1928 novel by Virginia Woolf. Once Grande Dames of Hollywood, by 1962 arch-rivals Bette Davis and Joan Crawford were in danger of becoming has-beens. Then an opportunity came along; to appear together in a new movie called “Whatever Happened to Baby Jane? ”Bette & Joan” depicts the two stars, in their adjacent dressing rooms where we can relish their wickedly funny and barbed dialogue, between takes on the set of Baby Jane. While Joan manages her anxiety by lacing her Pepsi with vodka and signing photographs for her beloved fans, Bette chain smokes and muses on her love life, and her ability to pick a decent script, never a decent man. Behind the bitching and the practical jokes we see each woman's insecurities and regrets, and their rivalry is revealed to be underpinned by grudging respect as they attempt to identify their new roles in life as well as in their careers.